In crockpot add your meatballs. 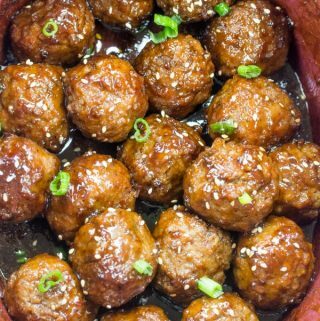 In bowl mix together your hoisin sauce, soy sauce, honey, rice vinegar, garlic powder and brown sugar and pour over your meatballs. Cover and cook on high 1-2 hours or low 2-4 hours. Once cooked sprinkle with diced onions and sesame seeds.